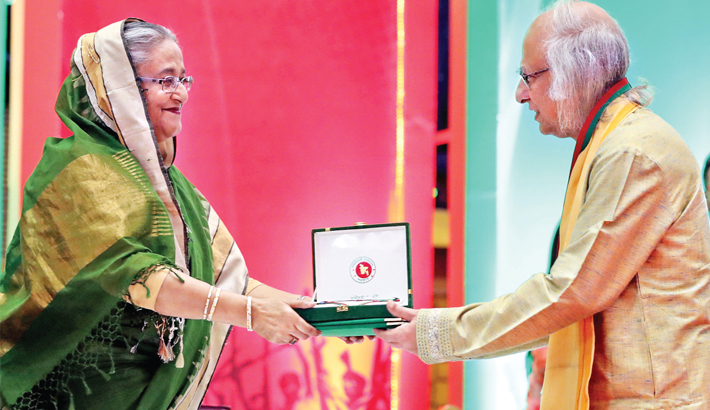 Palli Karma-Sahayak Foundation (PKSF) Chairman Dr Qazi Kholiquzzaman Ahmad receives the Swadhinata Puraskar-2019 from Prime Minister Sheikh Hasina at Bangabandhu International Conference Centre in the capital on Monday. A woman works at an antiques stall in a street in Hong Kong on Sunday. Hong Kong’s property buyers are back in droves, as commercial banks kept the city’s mortgage rates unchanged amid a dovish policy stance by the local monetary authority. An Indian book seller binds a ledger books, in Siliguri recently. Indian traders purchase ledger books to record their financial activity for the new tax year, which starts on April 1st. A worker checking mushrooms at a mushroom farm in Tongren in China's southwestern Guizhou province. The impact of China’s economic slowdown on Vietnam’s economic prospects may be relatively limited. Beijing recently cut its growth target for this year to the 6-6.5 percent range, from ‘about 6.5 per cent’ set for last year. The official GDP growth of 6.6 percent in 2018 was already the slowest in 28 years. In this file photo taken recently, a fishing boat leaves the port of Le Guilvinec, western France. Breton fishermen fear that they could be deprived from part of their fish resources and that tensions could raise in the English Channel as Brexit deadline is approaching. Their worse fear is that a no-deal Brexit would forbid the access to the British territorial waters all of a sudden. A juice vendor arranges her stall outside a shopping mall in Bangkok on Monday. Thailand's annual manufacturing output in February is expected to have risen at a slightly faster pace than in the previous month. Agrani Bank Assistant General Manager (Public Relations) Syeda Aklima Sultana presents a bouquet to bank’s Chairman Md Ashraful Mokbul at the annual conference-2019 of the bank in the capital on Monday.